Obituary for John Alton Mohon | Wheeler Mortuary of Portales, Inc.
Funeral services for John Mohon, 66, of Milnesand, NM will be held at 2:00 PM, Mon., Mar. 25, 2019 in the Dora Gymnasium with Dr. David McFadden officiating. Burial will follow in the Mount Zion Cemetery with the Portales Fire Department Honor Guard serving as pallbearers. The Milnesand Fire Department and all family members and friends will serve as honorary pallbearers. Those desiring to make memorial contributions may send them to the Milnesand Fire Department, 4607 NM 206, Milnesand, NM 88125, the High Plains Emmaus at highplainsemmaus.com or to the First Baptist Church Building Fund, 100 S. Ave C, Portales, NM 88130. John Alton Mohon was born Oct. 7, 1952 in Roswell, NM to the home of Josephine (Collier) and James Alton Mohon and died Mar 19, 2019 in Milnesand, NM. John was a 1971 graduate of Goddard High School in Roswell, where he was Manager of the Basketball team and active in ROTC. He went on to earn an Associate's Degree in Agricultural Mechanics from New Mexico State University in Las Cruces, NM. On Jan. 11, 1973 in Roswell, he was married to Patty Jenkins. After completing his degree, they moved to Colorado Springs where he worked as a carpenter. After a year and a half they moved back to Roswell where he was employed at Glover Meat Packing. Three years later they moved to Milnesand to help Patty's grandparents on their ranch. In the early 1980's he went to work at Kenneth's Tank Service. Ten years later, John began working in the oil fields. He took a brief break from the oil fields and became the 911 dispatcher for the Portales Police Dept, but after a year he returned to work for ACT Operating Co. in the oil fields. 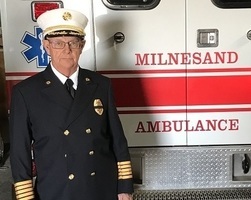 John became the Fire Chief for the Milnesand Fire Department in 2000, a position he still held at the time of his death. John was an active member of the Dora Baptist Church for a number of years. In Nov. 2003 he moved his membership to the First Baptist Church in Portales. John was an active member of the High Plains Emmaus. From 2008 until 2017 he served on the Dora School Board. He was a "Long Arm Quilter," and also enjoyed traveling with his family. He is survived by his wife, Patty of their home; a son and daughter-in-law, Chaddick Lee and Laura Mohon of Tatum, NM; two daughters and sons-in-law, Summer Louise and Mike Perkins of Spring, TX and Jessica Marie and Benito Alayon of Cypress, TX; another daughter-in-law, Kimberly Pettit Mohon-Montague of Eagle River, AK; eleven grandchildren; a brother, Eugene Mohon of Timberon, NM; and two sisters, Shirley Mohon-Holstrom of Timberon, NM and Mary Lou Mohon-Smith of Ft. Collins, CO. He was preceded in death by his parents, a brother, Robert Mohon, two grandchildren and a son, Christopher John Mohon who died Nov. 25, 2007.